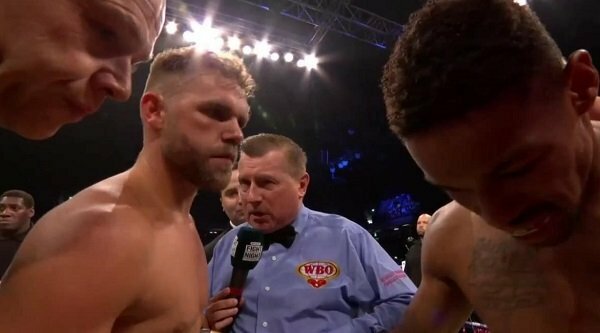 In a fight that failed to live up to the buildup, Billy Joe Saunders (25-0, 12 KOs) successfully defended his WBO World middleweight title on Saturday night in beating former world title challenger Willie Monroe Jr. (21-3, 6 KOs) by a 12 round unanimous decision at the Copper Box Arena in London, UK. This was not Saunders at his finest. He didn’t ever get out of 1st gear o make it exciting for the boxing fans that came to see him fight. Part of the blame rests on the shoulders of Monroe Jr., who spent the entire fight throwing jabs and not much else. Monroe wasn’t even busy with his jab. He was standing and waiting for just the right moment each time to catch Saunders with jabs. Monroe Jr. definitely looked good when he was catching Saunders with his jab, but he wasn’t throwing enough of them to win rounds. The scores were 117-111, 115-114 and 117-112. The 117-112 was a fair score. Monroe only deserved to win a small handful of rounds. What was frustrating about Monroe’s performance was he had hand speed and more than enough power to give himself an even chance to win, but he wouldn’t let his hands go. Saunders was no more powerful than Monroe Jr., and he didn’t have anywhere near the same kind of hand speed as Monroe. It was a fight that Monroe could have won with the right kind of training, and the willingness to follow instructions to the letter. Monroe could be a good fighter with right coaching. Unless Monroe makes major improvements in his game, it’s doubtful he’ll ever fight for another world title again. Saunders, 28, said after the fight that he’s ready to face the winner of tonight’s Gennady Golovkin vs. Saul Canelo Alvarez fight. Golovkin is the one that wants the Saunders fight, as he has the WBO middleweight title that GGG wants to add to his collection. Canelo hasn’t been too vocal about wanting to win the WBO strap. He’s not impressed with Saunders either, saying that he’d beat him with 1 hand tied behind his back. This would be a big step down for Canelo if he were to face Saunders after beating Golovkin. The money fights are against guys like Golovkin, David Lemieux and Danny Jacobs in the U.S. The casual boxing fans in the U.S wouldn’t care too much about Canelo fighting Saunders. That would likely be another Liam Smith level fight for Canelo, which means very few PPV buys from the boxing fans. In the undercard, light heavyweight contender Anthony Yarde (13-0, 12 KOs) beat Norbert Nemesapati (25-7, 18 KOs) by a 3rd round TKO. Next boxing news: Results: Jimmy Williams defeats Juan Rodriguez Jr.